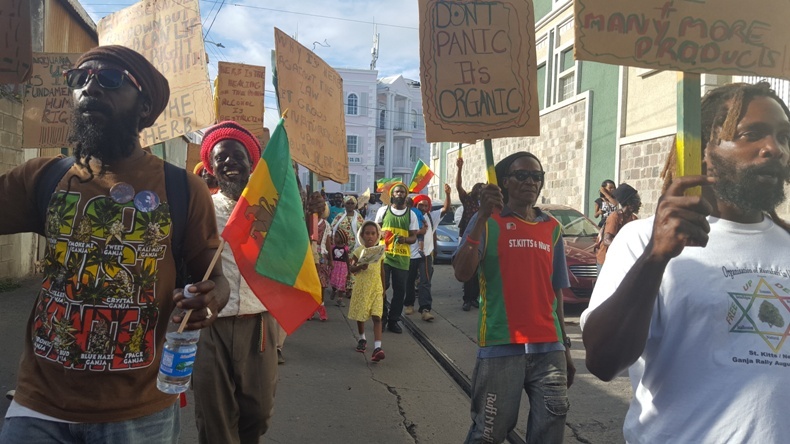 BASSETERRE, St. Kitts– On the afternoon of Friday 25th August, chants asking to ‘Free The Herb’ turned into ‘Free The Brethren’ after police arrested a Rasta man during the start of the annual rally segment of the event organised by the Organisation of Rastafari in Unity (ORU). 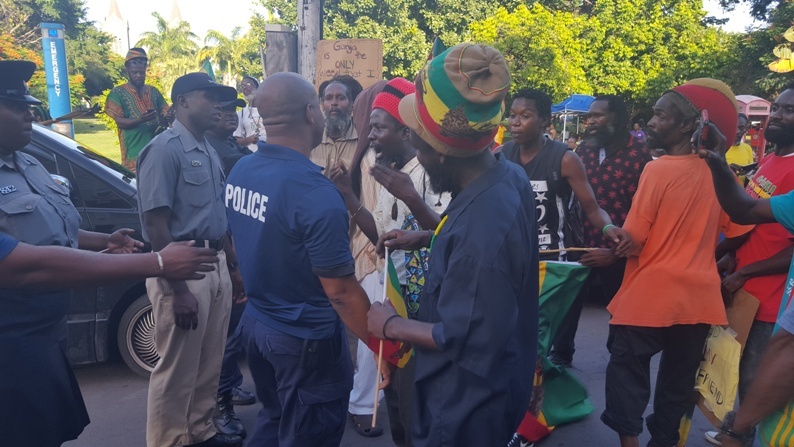 The controversial matter took place at the Independence Square as members of the Rastafari community and other supporters for the decriminalisation and legalisation of marijuana gathered together shortly after the march. After a fiery period- spanning more than 10 minutes- which saw some event attendees attempting to have discussions with the police and expressing sentiments of unjust treatment in relation to the arrest, came about a decision to resume the rally because the arrest was a distraction. 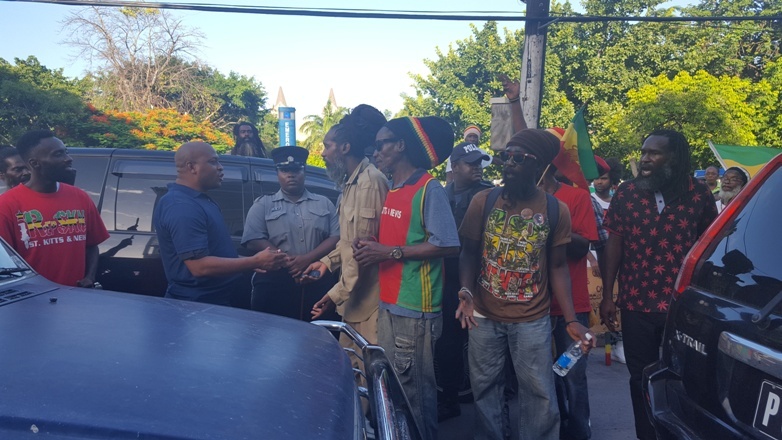 The arrested Rasta man was placed inside a police van parked on West Independence Square Street. ORU Chairman Ras Iroy, from the sister isle Nevis, during an exclusive interview with this media house having observed the situation, opined that the police wanted to show their powers. “I think they succeeded in a bit because they did take the attention (but) you know Rasta people, we stick together for one another in unity…” he pointed out. Another ORU member, Ras Sankofa, in speaking with this media house, said the arrest was a distraction. “We had to make a conscious decision to don’t let the police distract us but to go back to the rally,” he added. Furthermore, Ras Iroy, in speaking more on his scrutiny of the police, accused officers of not safely controlling the traffic while some event attendees were trying to address the arrest matter. “I literally took pictures of officers calling the traffic through when brethrens are standing up in the road, trying to get some ‘overstanding’ as to what happened to our brethren when the officer just there calling the traffic through, making utterances saying ‘let dem stand up dere then.’ I think that was totally out of order and I took some pictures and I hope to go further with it. “If the police in anyway felt like the traffic was being obscured, they were supposed to stop the traffic, clear the traffic and then allow the traffic to come through instead of calling the traffic to I and I,” he suggested. He observed that more people took part in the march this year. UPDATE: Information gathered by this media house indicates that the arrested Rasta man was released later that night without being charged. There has been no further information forthcoming on the matter.